You are here: Home / Features / What is the future of the Paignton Picture House Cinema? Originally known as The Paignton Bioscopic Exhibition Centre (not the pithiest of titles), the building showcased slides and short movies and, as was common practice back in the early days of cinema, the auditorium also played host to a 21 piece orchestra which played live during each showing. The closure of the Grade II listed building was a major blow to the local community, and its fate now lies in the hands of the National Trust. I caught up with two people who have affectionate memories of the cinema in its heyday: Preston-based projection enthusiast Stuart Saunders (whose website on the cinema is a goldmine of information) and filmmaker Anthony Bueno (who maintains a strong connection with Torbay having grown up here and is now based in London with a movie interview company entitled Premier Scene). Anthony was involved in raising awareness of the cinema’s plight prior to the National Trust’s involvement. Sean Wilson: So Stuart, you’re a projection enthusiast but what’s your background? Stuart Saunders: I’m an electrician but as a kid back in the 60s, the first machine I had was a little hand-held projector. In those days it was magic, that’s how it started. Then the following Christmas I received one with a motor. Then there was sound. We didn’t have a television and when you did get one, it was little, so to go to the cinema and see the real thing -there was an atmosphere back then which you don’t seem to get in many modern cinemas. The old cinemas are beautiful; just when you sit down, you’ve got loads to look at, and then you’ve got the screen which is hidden behind curtains. SW: And Anthony, you have your own production company so what’s your background? Anthony Bueno: Well, bizarrely, it’s perhaps when I was working as a waiter than I began to think seriously about cinema. My Dad ran a restaurant in Birmingham and there was a cinema -I saw The Jungle Book as a kid there. You could sit in the seats and just stay there, and I saw Mickey’s Christmas Carol and The Jungle Book. It eventually shut down, but I remember it being so big and something that’s always bugged me about modern cinema is how they’ve been compartmentalized and shrunk down, almost. I left Birmingham and then went into computers for six years at the local hospital. But I’ve always been fascinated by film. However, I never believed I would become a filmmaker. Even now, it’s slightly surreal! It was the one area of life I hadn’t really explored that I was really passionate about. I’ve always loved going to the cinema and seeing films such as Ghostbusters, so I went to film school in London and ended up doing that for a year. But I’d come down [to Torbay] pretty much all the time and on certain tipsy evenings with friends, I always used to stroll past the Paignton Picture House. And in fairness, I remember it being a bit tatty, but with a lot of potential. I’ve always had an affinity for cinemas and the fact they just seemed to dwindle when Torbay used to have five… I saw Back to the Future at the Coliseum where Littlewoods is now, and the Care Bears Movie but that’s beside the point! But when a cinema with so much character and history closes down, it’s mortifying, and everything has become so industrial now with the multiplexes. Of course, they have their place and with the amount of movies on release nowadays, it’s the only way to get them all out there but they’re a tad soulless and I was so sad when the Paignton cinema shut down. I remember walking past with my mate thinking you could do so much with a place like that. Architecturally it’s gorgeous and yes on the inside it’s a bit tatty but it’s only superficial and a bit of graft would improve it. I also remember thinking if this was in London, it would be a big money earner. As time moved on and I progressed with my filmmaking, I talked to different people and learned about a local community banding together to save The Rex in Berkhamstead. It’s a gorgeous cinema now and one of the most successful in the country. In fact it appears in the film Son of Rambow at the end. It’s very relaxed with tables and chairs and you’re not kicked out like I was at a chain cinema recently following a screening of The Artist. Anyway, I’d been up in London for about a year and I contacted a group that were trying to do something with the Paignton cinema, and I said I’d be prepared to film something to put on the internet but that didn’t work out. SW: So did the Paignton Picture House have a particular romantic appeal? SS: Yes, I mean it’s nearly 100 years old. It was built back in the silent era and back then cinema was treated as a day out. That was what people really looked forward to, it was a whole new world, just magic. And I think that magic is what you remember as a kid. The screen, as I said, was hidden behind the curtains and it was a rule in those days that you never saw a white screen because the magic was behind those curtains. So as they start pulling back, the picture’s already on, and the projectionist used to get in trouble if ever a white screen was seen. It was a performance by the projectionist as well, and he was in control, the lights dimmed, the whole thing was put together. Whereas today it can just be switched on. SW: So there was a theatrical aspect to it. SS: It was showmanship, yes. And that’s been lost now with digital. Nowadays you just press a button and it’s all done on a computer. It’s all pre-timed, the lights are dimmed automatically, so there’s no actual showmanship involved anymore. SW: So why is the role of the projectionist so vital when compared with digital projection? SS: To go back to what I said before, he’s a showman. [Former Picture House projectionist] John Mann is a perfect example of a showman. I recently did a little thing for him at the Church Hall opposite Paignton Post Office for the Paignton Preservation Society -we put on some old Charlie Chaplin films, and we had Pam, the cinema’s former pianist, playing along live. And it was fantastic. I’m not the biggest fan of Charlie Chaplin but put to the sound of live playing from Pam, it came to life. AB: It’s almost like travelling back to a magical time that was less processed. Just to go back to Ghostbusters, a couple of years ago I saw it on an old print and it was admittedly a bit knackered but there’s a charm to it. Likewise, you can’t beat the charm of sitting in an old cinema with a group of people who are so enthusiastic and bring energy to proceedings. A couple of days ago, I attended a demonstration by Getty Images, they showed a short film about 20 minutes in length composed entirely of off-cuts, stock footage from the studio. There was just something about watching this black and white footage shot prior to the 1906 San Francisco earthquake -it’s fascinating, and I think at one point that actually captured the earthquake unfolding on-screen. SS: Digital is a natural progression. The cost of making a film print is very expensive and so many prints have to be made for release on the same day, all over the world. So it’s obviously a lot cheaper to put it on the hard drive, it had to go that way. But I think as the years go on, digital will bear comparison with the Paignton steam train: film itself is the progenitor and people will take an interest due to the historical context. When you travel on a steam train for example, there’s an atmosphere. 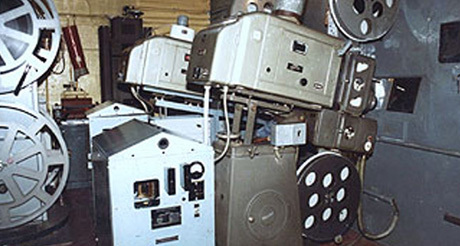 But as far as I’m concerned, that’s the future of Paignton Picture House: modern equipment but I’m sure you will be able to get prints to show in the future. AB: I remember talking with someone who ran a chain of cinemas and he said, when we’ve tried to show old films, no-one turns up. But he also said, if you focus the marketing campaign around certain movies, then you’ll probably get more people in. For example at the Prince Charles Cinema in Leicester Square, they do double bills such as Die Hard and Lethal Weapon, Gremlins and Ghostbusters and so on -it’s down to the marketing and you must have several revenue streams going into the business to make it work. When I first met Stuart and John Mann, I imagined Tapas food in the Paignton cinema, snacky things, a proper bar with cocktails and so on, which would assist in creating a relaxed atmosphere for film enthusiasts. SS: In Oldway every Monday or Tuesday, there’s the Organist’s Society, which is connected to the cinema in many ways because organists were associated with cinemas. I’m sure lots of societies would be delighted to use the cinema as a meeting place. It’s got to be very community based. SW: How did your website come about, Stuart? SS: I just felt there was nothing out there at the time stating information about the cinema. I’m more interested in the machinery than the films per se and I would say that the vast majority of the people who used to patronise that cinema didn’t know what was behind the porthole at the top. It was a very involved job. It wasn’t just about switching a lamp on, it was keeping control of the lighting and sound, 20 minutes per projector changeover, 101 different things. I’ve always had a passion for that poor guy up there that nobody knows about. SW: Anthony, you’re listed as a ‘friend’ of the cinema on Stuart’s website. Was your primary role to raise awareness? AB: Yes, although the National Trust are the main ones involved now. We took a step back when they got involved. But it’s a very complex process. There were times when the railway would contact me but discussions had to go through a lot of other people first. I’m sure there will be a moment when all this waiting will seem like a long-distant memory. It’s like when the Star Wars prequels came out -it took a long time except that instance it wasn’t worth the wait! We did a talk recently with a group of people in Paignton and every time a group meets up, there will always be someone who’s completely unaware about the project involving the cinema. SW: So when the cinema closed, what detrimental effect did that have on the local area? AB: I think it had a major knock-on effect in Paignton. There’s a lot of history in the town -you have the theatre where Gilbert and Sullivan once played -and I don’t think the town’s been quite the same since. Everyone looked at that cinema as the heart of the town. However, by the same token, it’s obvious why these sorts of cinemas close: they can’t compete, they get run-down and they don’t earn enough. You have to invest money into it, you have to ensure it looks up to date and clean. But it was apparent for years that money wasn’t being invested in it, so it’s no wonder people go elsewhere. SS: Well, it was a matter of competition. John believed it could compete, but I wasn’t so sure. It was looking tatty, as Anthony said, and with full Dolby Digital sound systems elsewhere, it was destined to close. The cinema needed money spent on it there and then for better equipment, better seating and so on, and at that time, nothing happened. Dampness is now creeping in due to the presence of the stream beneath the building -let’s not forget that the land all the way up to the railway is reclaimed land. And of course a building without any heating but suffering from damp will eventually crumble over time. With every year that passes, I think you’re talking about more money. Each given cinema doesn’t really make money out of a film, you have to pay to hire it, and the cost is phenomenal. The bigger the film, the more they’ll likely have to pay. A re-run is less so they don’t have to pay so much for hiring it, so all the money is made out of popcorn and so on. SW: With what’s happened to the Picture House, do you think that’s representative of how independent cinemas are now competing with multiplexes? SS: Well, I would still encourage the installation of modern equipment [in the Picture House], so you can show up-to-date movies. And I think you can compete in other ways, you can do your own thing. If you brought the stage out for example, you could put on small stage acts as well. I think you can open it up. You can’t just see it as a cinema, you must see it as a meeting place where Paignton people can get involved and put on what they want. There’s a cinema in Bristol near Cleveland, that’s community based and seems to be packed out for most performances, so it can be done if done properly. AB: You want to create a sense of occasion. Years ago, people would dress up to go to the cinema, and that whole way of doing things has kind of gone. But I’ve always said, the Picture House isn’t just for Paignton or Torquay, it’s for the whole of South Devon or even the whole of Devon itself. We need to encourage people to travel more than 10 minutes beyond their front door but it has to be worth the journey. In London, I have to travel up to an hour to reach The Rex Cinema but it’s such a great place, there’s a nice restaurant connected to it and you can go and watch a film in real comfort. If we can get some of that down in the Paignton Cinema, that would be fantastic. SS: And it all depends on which films you’re showing. The blockbusters for example might attract more kids but they’ve got to be involved more. They shouldn’t just see the film, they should understand the whole process behind filmmaking. The other suggestion was for facilities so kids could create their own news and to show it. SW: Anthony, you’ve interviewed some very famous people, but you would seem to have a vested interest in this local cinema? AB: Well, John Mann always said it would get national coverage were it to open again, and I think it would due to its age and the fact that there aren’t many such buildings left now. We’ve always tried to find celebrities who could become connected to it but most of them have died! Agatha Christie and Oliver Reed used to come down, Tommy Cooper as well. There’s a great film which they shot at the Palm Court Hotel called The System by Michael Winner and it starred Oliver Reed. That’s how he’s connected to the cinema. I believe the Pythons were there at some stage, I did meet Terry Gilliam in the latter part of last year and I asked him if he remembered the cinema. He said he wasn’t sure. I sent [Torquay-born cinematographer] Roger Deakins an email message and he said he never went there. I think the benefits for the town would be immense. Those more affluent tend to go to Exeter and when the cinema went, that was a big thing for Paignton. But I would love for the cinema to bring focus to the local area again, albeit not in a Fawlty Towers sense, and it would be great to get someone marginally famous attached to the project, it would get the whole thing launched. That’s what the National Trust are trying to do, get the word out. But a lot of people simply don’t know that the cinema is even there because it’s boarded up and they just walk past. Some people don’t see the relevance of re-opening it and want it pulled down and replaced with something else. SS: There are still a lot of people who don’t seem to know about the place. Just to be able to walk into the foyer would help. Health and safety would probably restrict you from going any further but to be able to see the place would be amazing. There will be restrictions due to it being a Grade II listed building. Structural changes will have to be made to make the place a success. That’s the next problem. AB: One of the ideas I had, was to introduce tables and chairs but how do you go about it? You can’t change the floor because it’s original. SS: You could build over the floor. I think the balcony area would need to be left alone. That needs to be kept in its original state but to get people into the main area downstairs, there’s 101 things to do. It’s not going to be easy. AB: A lot of young people aren’t familiar with the place because they were too young when it was originally open. I realise, through gritted teeth, that they would likely to have to show movies like Transformers. At the Curzon in Cleveland, when they screened The King’s Speech, it earned enough revenue to keep the whole place open for a year, and it’s a good film as well. SS: And they’ve got new digital equipment in there as well as the old stuff. SW: Well, a lot of cinemas compromise now with digital and traditional. Is that a way forward? SS: Well I don’t give it many more years before they stop using film. They’ve still got them in the vaults. There are 70MM societies in Germany and other places where they get together and make a new print from the one that’s in the vault, it costs a few thousand pounds, and you get people watching that. There are still ways and means of being able to watch a film but you’re not going to get the current releases. AB: Digital is simply cheaper, and it’s becoming cheaper. SW: Just to return to the cinema, is the National Trust essential to its survival? SS: Yes, without their involvement, it might never happen. You need that main focus which the Trust has got, they’ve got a lot of respect and they could help in getting lots of other organisations on-board. SW: So to sum up, why is the survival of the cinema so important? SS: It’s the history. It’s one the few purpose-built cinemas. There were many that were converted from theatres into cinemas but there aren’t many surviving that were built to show films. I think there are just 4 or 5 left in Europe, probably a few in America but not many. And it’s in Paignton. AB: For me, as a person who loves these old places, the history is fascinating. Those were the places where you’d go and dream, and you’d see dreams come to life and you’d see what the possibilities were. There are so many emotions connected with those kind of buildings and to see it just go… You lose part of the town’s identity familiar from your youth. There are so many places in Torquay like that, old buildings which don’t exist anymore. But that’s life, eventually everything becomes a memory, and that’s how it is with the cinema. I didn’t go there all the time because I was Torquay-based when I was growing up but it’s still part of my past, it’s a part of cinema history. Some people might not care less but even those with a vague interest in films, it would be a huge loss were it to close. AB: There’s a place near the Pavilions in Plymouth which used to be an old theatre where Laurel and Hardy played their last ever performance, and that was converted into a nightclub. But now that’s derelict, one of the few surviving Victorian buildings. SS: Even if the Picture House was saved, I don’t think the construction would hold up due to dampness in the walls and so on. I think it will get knocked down if it isn’t saved. It’s got to be part of the community. In order to get people coming back time and time again, it’s got to function as a meeting place, not just a cinema. What I would personally like is a focus on education, to get schools involved and put stuff in there, modern and traditional equipment so kids can see how films are made. Quite simply, you’ve got to get young people in there, you can’t just put on old films. An old film with live accompaniment from a pianist would be great as a one-off but not every day but it’s got to be opened up. Anything and everything to do with entertainment. AB: Sometimes they try and save the front of these buildings but that would be pointless. Birmingham Children’s Hospital, which I was familiar with as a kid, is now a multiplex casino, and I went there and it is just soulless. You’ve still got the front of the building there but the rest of it’s gone -apart from saying ‘Children’s Hospital’ along the time, there’s nothing to signify what it once was. If that were to happen to the Paignton Picture House, it would be a sad loss indeed.